Failed to configure the Boot Camp partition's hard disk. A disk configuration error has occurred. Make sure that you have read/write permissions for the disk. Start Parallels Desktop for Mac. Click on the Parallels icon at Mac's menu bar -> Preferences... > Advanced tab > enable Use detailed log messages. 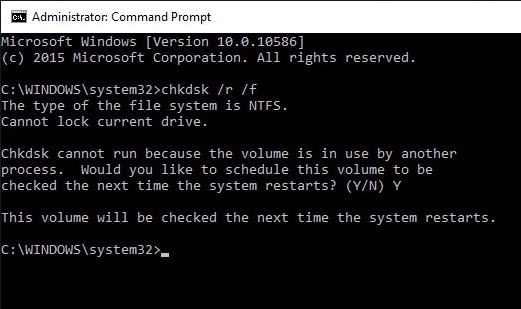 NOTE: Command Prompt will offer you to schedule volume check at the next time the system restarts. Type Y and hit Enter/Return. Restart Windows. Follow the procedure of disk scanning and repairing. Boot back to Mac OS X. Try to create a new Boot Camp VM (delete a previous Boot Camp-based VM first if you have one). Open Parallels Desktop preferences again: click on the Parallels icon at Mac's menu bar -> Preferences... > Advanced tab > disable Use detailed log messages. If you still not able to create a Boot Camp-based VM, please send us a problem report, save its ID and contact the Parallels Support team for assistance.